DILKON, Navajo Nation -- Louise Benally of Big Mountain describes the endless struggle against relocation, Peabody Coal and livestock seizures. Now, there is no rain, the food is not coming back, and windmills are dry. During decades of struggle, the traditional Hopi have joined the Dine' of Big Mountain resisting relocation. They all realize that Peabody Coal's relocation is a land grab, a land grab for coal to make electricity for other people, other places. During an interview at Dine' CARE's Peoples Convention, Louise described the resistance to colonization and mining since the 1960s on Black Mesa. Speaking with Spirit Resistance Radio, Louise said in 1968 Peabody Coal came in and began developing the land for coal resource extraction to make electricity for other people. "So the rest of the U.S. would have electricity and water at their pleasure," Louise said. Legislation was drafted in 1974 that called for the relocation of more than 10,000 Navajos and over 200 Hopis. The U.S. drew lines without the consent of local communities. "My community decided not to move." Big Mountain teamed up with traditional Hopi and opposed it, and knew it was just a land grab. "Most of my elders are no longer here." Louise said people talk about Dine' of Black Mesa in the past tense, but they are still there. "We are still here. We continue to live our way of life." "We continue to practice our traditional ways of oneness with nature." Louise said they struggle and do everything they can to get this land grab reversed. Louise said Navajo Generating Station near Page might close in 2019. "We are hoping it will," she said, adding that it is time for solar to replace coal fired power plants. The whole Four Corners has oil and gas wells, coal mining, and there are seven power plants in the region. All this is causing a lot of greenhouse gasses, she said. "We're impacted, we have a lot of health issues," Louise said, describing the toxins and contaminated waters. "A lot of people lost their lives struggling against these different diseases and toxifications of the air, water, and the environment." "There are no regulations on these coal fired power plants." Now, there is the drought. "We had no winter in 2017," she said, adding that there was very little rain. "The land is basically dying." "We don't have green grass." It is devastating. Our food didn't come back. We hope and pray that they will shut these coal fired power plants down." The struggle has been endless. Joining the gathering at Dine' CARE, Louise said they are all practitioners of the old ways, and it doesn't matter what label people wear. "We have to unify and stand together the best way we can." The water table has dropped, and the aquifer is not providing enough water for the windmills. The water around Peabody Coal is contaminated, and the people are hauling their water from there. Louise said Dine' could dig into the ravines at Big Mountain when she was a child, and by morning there would be water coming out. But that doesn't happen anymore. The water has been drained in the aquifer for the electricity that is now going to southern Arizona. "The drought is so severe, and there is no water in some of these windmills." "Water is life, everything requires water to live." She said the corporations want all of the water, there is no conversation about leaving water for the people. "People don't want to know the reality," Louise said, explaining that Dine' people are not fully involved in the conversation about what is happening, and the discussion of water for 20 or 30 years from now. 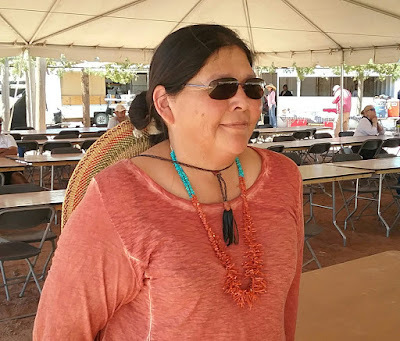 Louise lives 15 miles from the coal mine, and she has no electricity, no power, and because they are resisting, they have no social services from the Navajo Nation, the U.S. government or anyone else. "They are trying to starve us out." Now Hopi rangers are "stealing our animals." That is the peoples food, she said. "We are not allowed to grow food. We have so many laws stacked against us." Louise encouraged people to come out. She said she can be messaged on Facebook, Louise Benally. Louise said there are many needs and people can help. She needs a vehicle to haul water, and windows for her home. Her root cellar roof collapsed because Hopi rangers drove over it. There is currently a resistance camp that people can come to. Describing how the Navajo Nation government is an arm of the U.S. federal government, Louise said the Navajo Nation government "is in bed" with the corporations, signing away the resources with leases. 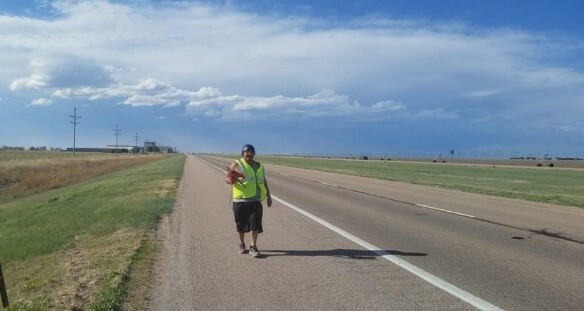 Because of this resistance, the Navajo Nation government "doesn't want to do anything for us." "They are an entity of the federal government." Traditional Dine' are land based people and are different from the Navajo Nation government, which is an entity of the U.S. federal government, she said. The IRA Indian governments are what has always been working with the corporations to sign the energy leases. And U.S. taxpayer dollars are making these corporate deals possible, she said. In conclusion, Louise said, "Pray for us to have rains." Article copyright Brenda Norrell. No portion may be used without permission, or used for revenue generating purposes.